Dynaudio is demonstrating its LYD 5, LYD 7 and LYD 8 professional nearfield audio monitors designed to deliver precision sound reproduction in small sized studios. 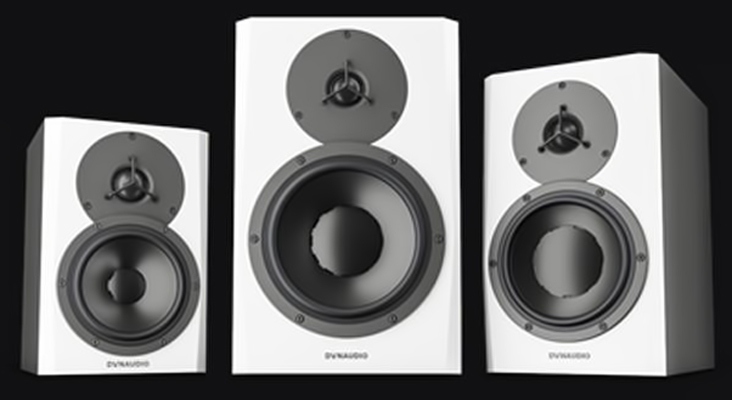 Dynaudio said the LYD series redefines its previous line of professional monitors. The LYN 8 is the largest monitor in the series with an eight-inch woofer and advanced digital signal processing. LYD monitors, made in Denmark, use a ferrite magnet system with vented pole piece for accurate driver control. A large diameter voice coil surrounds the magnet for superior linearity. The aluminum voice coil and wire are low mass so its transient response is quick and accurate. To ensure the ideal mix between stiffness, weight and dampening, the diaphragm and dust cap are molded in one piece with the company’s proprietary magnesium silicate polymer. The speakers are designed to reduce unwanted bass buildup in corners and close walls. They have a wide sweet spot and include EQ filters. The LYD series. Click to enlarge. The LYD 8 is a bi-amped speaker design with 50 watts for high frequency and 80 watts for low frequencies, using Class-D amplification. There is a bass extension to extend or curtail the low-end frequency response. Two different tunings are used — one for free standing and one designed for speakers located within 1.5 feet of the wall. The sound is balanced to influence the overall response of the speaker. The monitors are priced between $559 for the small five-inch model up to $789 for eight-inch model.